That’s wonderful! Might have to steal it. Glad you love it, Olga! 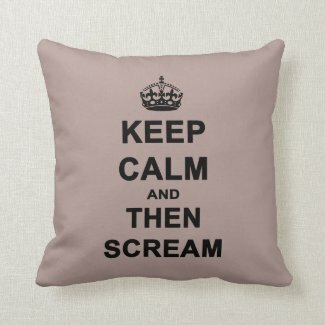 Scream is so much more likely than Carry on! Loved the story of you screaming on the beach. There’s a Dory Previn song I used to listen to a lot in which she sings about being pulled over by a cop because she was screaming in her car. Done that too when deep in the countryside! Another classic from the uncrowned Queen of Cushions. Nice adaptation of n often over-used motif, Sarah. 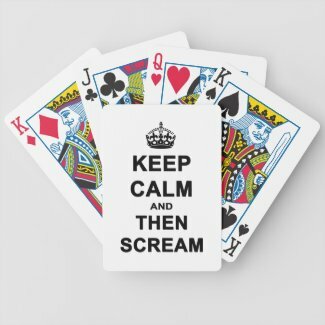 When I first did these, the ‘Keep Calm’ craze was past its peak and everyone was bored but I couldn’t resist my take and I have sold several items! I love the humour behind this design Sarah.